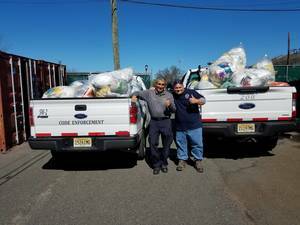 UNION, NJ - The Township's Annual Waterway Cleanup will be held on Saturday, April 27. Check-in at the Township of Union Department of Public Works, beginning at 9:00 a.m. followed by "Touch-A-Truck” tours. Clean-up begins at 10:00 a.m. Supplies will be provided. Volunteers should bring rubber boots. Tours of the Community Garden, 822 Liberty Avenue, from 12:00 to 2:00 p.m.
All are welcome. There will be activities for all age groups. All supplies will be provided, including rubber gloves and poke sticks and volunteers are encouraged to wear boots. Pre-register online today at uniontownship.com.